THB Ocean Beach hotel has proved itself to be the ideal destination for those wanting to enjoy the best San Antonio has to offer. 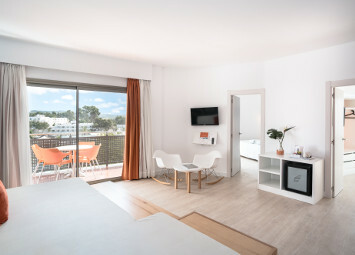 Located just next door and overlooking the world famous O Beach Ibiza, guests staying here will enjoy access to the venue via a private entrance and, by booking directly with us, free entry to the beach club Monday to Saturday plus 50% discount on Sundays. Our guests will also benefit from 100% discount off the cover charge of their first bed booking in the venue with a minimum spend applied (subject to availability). 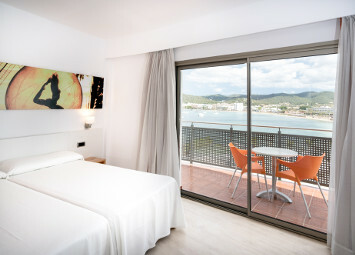 With stunning sunset and sea views, a gourmet restaurant , huge pool with gym and chill out zones, and stylish rooms, this hotel has all you could want to enjoy the full Ibiza experience. 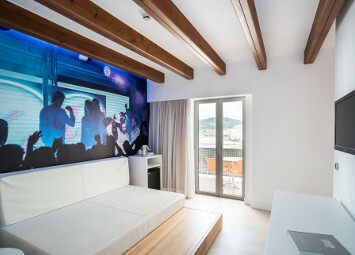 A modern fully equipped standard double room. It has air conditioning, safe, Mini Bar, flat screen TV and complete bathrooms with multiple amenities. Maximum capacity 2 people. Featuring all the benefits of a double room plus the added luxury of stunning sea views of San Antonio bay. Open plan with 2 twin beds plus one sofa bed, separate bathroom, balcony and all amenities such as air con, safes, fridges, etc. These spacious rooms are great for those wanting additional comfort. The same benefits as our Junior Suites but with beautiful sea views. Exclusive design and space make this a room designed for those who only want the best. It has two double bedrooms, a living area and a breathtaking view to the Mediterranean.